The Giglio Suite is located on the third floor without lift of an historic building, Palazzo Gaddi, located in the San Lorenzo district, in the bright square of Madonna degli Aldobrandini where you can find the famous Medici Chapels. 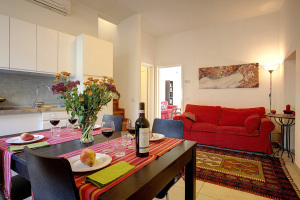 Duomo, Piazza della Signoria and the railway station are within a 3 minutes walk. The historical Mercato Centrale is just two blocks away. The apartment (70 square meters) is a bright, spacious, comfortable flat. In this apartment there are two bedrooms: the first one, with a double size bed (or two single beds) overlooking the silent courtyard, and a big wardrobe; the second one, really spacious and bright, with a double size bed (or two single beds) and a pull out sofa bed, overlooking the majestic Medici Chapel and with a view of the Duomo and the Giotto’s Bell Tower. Next to the second bedroom you can find the nice and modern bathroom with a shower (hairdryer available). In the living room there is a second double sofa bed and a square wooden table with design chairs; the white kitchen is fully equipped with oven, microwave, fridge, freezer, gas hob, dishwasher. The apartment is extremely quite and peaceful. WIFI internet access, TV, AC. Garage (not included) and a minimarket 30 metres from the property. Are you traveling with children? Upon request we offer the possibility to add any equipment you may need to keep your baby confortable (extra bed, babycot, bottle warmer) or to suggest you itineraries tailored for families with children. Are you looking for Italian fashion? We may help you to find your way to the best fashion outlets (Gucci, Prada, Barberino Designer outlet) right out of Florence. The building offers the possibility to choose between six different types of apartments and also allows customers to combine multiple solutions if families or larger groups wish to stay together in the same building.